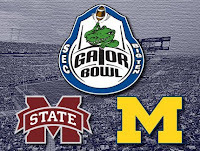 MICHIGAN IS GOING TO THE GATOR BOWL! It's official – Michigan will face Mississippi State for the first time ever on January 1 in Jacksonville. Ticket information coming soon so you can make the trip to watch the Wolverines battle the Bulldogs on New Year's Day.